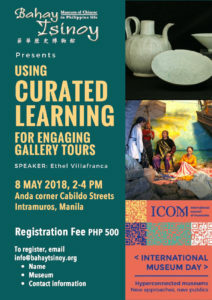 One of our PhD researchers, Ethel Villafranca, will be conducting a two-hour participatory workshop on using museums/galleries (the spaces and objects within) for teaching and learning in the Philippines. This workshop will be heavily informed by her PhD research, Curated Learning. Only 40 people will be accommodated in the workshop. This is to allow better engagement with and among attendees. It will require attendees to actively participate in individual and group activities designed to immediately apply/test strategies of Curated Learning that she will present. Ethel has been conducting programs aimed at sharing expertise and resources in working towards developing more dynamic, engaging, and inviting cultural centres all over the Philippines. She completed her master’s degree in museum studies, on a Fulbright scholarship, at the University of Florida. She is currently a recipient of the Melbourne International Research Scholarship. Her research interests include museum education, visitor studies and evaluation, and pedagogy and space for schools. To register, please send an email to info@bahaytsinoy.org with your name, museum, and contact details.